Tech and science are notoriously male-dominated fields, which means girls and women interested in STEM lack powerful female role models. 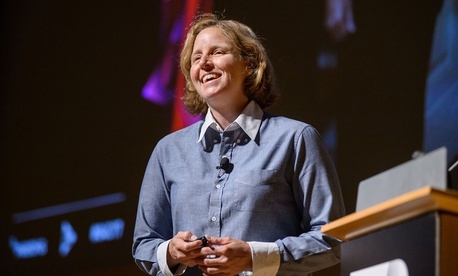 This predicament took a major step forward in 2014, when Barack Obama named Megan Smith the third US chief technology officer. This made her the first US CTO with technical experience (really), and also marked the first time that a woman was placed in the highest technology role in the nation. As CTO, Smith guided the Obama administration’s information-technology policies and initiatives and continued her life-long obsession with green innovation. (She modeled her first solar house in the 1970s as a child.) She also used her platform to be an advocate for women and LGBTQ people interested in science and technology. Prior to the White House, Smith spent over a decade as a vice president at Google, where she led the new business development team, acquiring platforms like Google Maps and Google Earth. She then co-led Google’s advanced-products team, creating SolveForX, a forum encouraging tech-based moonshot thinking and collaboration, and WomenTechmakers, a tech-diversity initiative, where she piloted unconscious bias training across Google and beyond. In an interview with Quartz, Smith explains how to enact “radical inclusion,” why high-level leaders should seek collaboration, and the Star Wars metaphor that explains her attitude toward supportive professional relationships. 1. What’s your big idea that other people aren’t thinking about or wouldn’t agree with? Why is it so important? Radical inclusion and connection—of people, networks, ideas, needs, and resources—accelerates positive change, driving creative confidence for all. The breadth of human capacity and capability is extraordinary, especially when we are properly networked for faster sharing and iteration. Our world is full of committed, creative, passionate people who collaboratively solve challenges in their communities, often working together in unexpected and creative partnerships, and often with limited resources. Promising, partial, or full solutions to tough problems are out there and discoverable, yet sadly people with these solutions are too often our best-kept secret and not positioned for acceleration. Effective teams are scaling networked approaches to include far more of humanity in commercial and organizational activities, which remain so biased and discriminatory today. They take all forms, from TimesUp, BlackGirlsCode, WomenTechmakers, Grace Hopper Celebration, RiseoftheRest, StartupWeekend, #BlackLivesMatter, Algorithmic Justice League, and CSforAll, just to name a few. These networked teams and movements are working to break down systemic bias and other activities that decelerate women, people of color, those with disabilities, and LGBTQ talent. Connected, innovative, diverse networks will fuel positive change, thriving environments, economic health, and mobility for all. 2. What behavior or personality trait do you most attribute your success to, and why? Life is a team sport. I love to work in teams with other solutions-oriented builders who have broad-ranging skills. I see talent everywhere and in everyone. Connecting and collaborating with people who have shared goals—especially those with complementary skills and resources—can be amazing. I try to find ways to bring kindness into the room and support everyone to gain more creative confidence and connections to resources—and each other. 3. If you could make one change to help women at work—at your company, industry-wide, or on a policy level—what would it be? Prioritize inclusion in everyones’ shortlist—move it from a top-20 to top-three priority. This is especially critical for executive leaders of all kinds of organizations. In 2016, Laura Weidman Powers and I compiled some of what we’ve heard and seen work in terms of creating a more diverse, inclusive, and equitable science and technology workforce. We wrote the results up in a White House blog post called “Raise the Floor.” Some of these included accelerating the use of simple yet important behaviors, like giving some of your agency or lending power to others, formalizing inclusive coaching, and practicing graciousness. For example, reinforce what women say in meetings and proactively support all women to move forward on their ideas, programs, and work. For women and men, adapt the culture of workplaces to let everyone bring their most effective styles and be themselves. Laura Listwood, author of The Loudest Duck: Moving Beyond Diversity, talks eloquently about the challenge of “style compliance” that accelerates some and decelerates others. We need to debug our workplaces and remove practices and systems that are debilitating for so many. 4. At the start of your career, what do you wish you had known? What, if anything, do you wish you had not believed? I have had the chance to work with extraordinary people throughout my career. I am grateful for all of them and for people who provided the kinds of environments where we could all thrive. I don’t think I actively knew this was important at the outset; now I can see it in hindsight as a very important component of having impact and fun. Over and over again, I’ve worked with great people on amazing programs, products, and ideas. Find people you love working with on topics you are passionate about who have a broad and diverse range of talents—and, importantly, who believe in you. Exposure, mutual respectful, and action-centric collaboration will build you personally and accelerate the work. If people are mean, try to shift them, and if you can’t, find others. There are over 7 billion people in the world, so there are lots of options for teammates. 5. When in your career did you feel most despondent, and what did you do to turn it around? At various points I’ve run into people who wield their power in a diminishing way to others, and sometimes that has been directed at me. They have the arrogance to feel their way is the best, and that others need to comply with them. They negatively critique and cut you down rather than help you move forward, often using a guise around some practice or corporate way that probably works for them, but not for many others. Instead, they could adapt and broaden their approach to include the breadth of talent and styles and methods that are as varied as humanity. In Silicon Valley especially, I sometimes ran into people who acted like this and were basically corporate bullies. It can be breathtaking to see the lack of self awareness in some people and the hurt they inflict. It is often those with significant privilege, in some form, who engage in abusive intellectual combat, and often there are bystanders who enable them. Certain behaviors are really unnecessary, and when I encounter people like that, often I’m taken aback, and not always as fast on the draw when dealing with micro- or macro-aggressions. In later reflection, I often see how messed up someone’s behavior was, but the moment to push back on them has passed. Encounters with people who behave this way typically diminish my confidence and slow my momentum. Kindness is as important as knowledge, sometimes more. The way I try to recover from this is to not be afraid to share with others, as I often find out that they’ve had similar challenges. Our conversations reveal patterns that bring better understanding of what happened, and they are helpful for use in the future. The Dalai Lama has said that the only thing he has ever seen to truly alleviate great suffering is to know that one is not alone in that experience; kind, authentic networks matter. 6. A key part of success is building strong professional relationships. What practice do you use to cultivate them with your colleagues? I have an open and shareable approach to my work. When I’m working on projects, I reach out to others on email, or include people in meetings that might be of interest to them (often by video or audio conference). I try to encourage cooperation at all stages, as well as collaboration across people with shared interests and diverse skills. Senior people who have a lot of access or agency can help give cover for new emerging ideas to move forward—including them as coaches can help. I try to do this for others when I can, and appreciate when people do this for me. I sometimes call them the “Obi-Wan/Leias” who have great expertise in making things happen, can bring quick insights and empowerment, and can help remove roadblocks. 7. What’s best advice you ever received, from who, and why? I took acoustics from professor Amar Bose (of Bose Corporation fame) who told us to follow our passions, to really pay attention to what we were interested in, and to work in those arenas. He shared that he had personally been headed in another professional direction when he decided to do some summer work exploring audio technology with a stereo system, which brought him into the whole world of acoustic adventures and innovation. He counseled us to pay attention to what we were drawn to in the many serendipitous paths that might emerge in life. He also emphasized working with people who build you up and enable you to bring your unique talents into the team and into the world. The mountain I’m willing to die on… is working together for inclusion, kindness, and accelerating talent. If we include everyone, we can probably fix (nearly) everything. I wish people would stop telling me… to choose one focus, as I think intersectionality and interconnection are where many answers are found. The universe does not ring a bell between subjects like we do in our schools. Everyone should own… or have access to a bicycle, especially children everywhere. This interview is part of How We’ll Win, a project exploring the fight for gender equality at work. Read more interviews with industry-leading women here.